People waited in line to make purchases at a Macy's department store in New York during last year's "Black Friday" shopping weekend. Black Friday may not yet be a bigger holiday than Thanksgiving, but it certainly has a bigger marketing budget. Retailers may have needed it to overcome the term's long and negative history. And that's well before you get to talk of striking Walmart workers, or violence involving impatient shoppers in recent years. Older generations may still associate "Black Friday" with the stock market crash of 1929, which triggered the Great Depression. But the connotation of financial distress dates back even further, to the collapse of the U.S. gold market on Sept. 24, 1869. "The term Black Friday survived to be used again and again for various disasters and unfortunate events, including a 1910 incident in England where police assaulted several hundred suffragettes at a protest," notes Richard Townley in The Washington Times. What does any of this have to do with shopping? Perhaps nothing. But even the earliest references to Black Friday as a post-Thanksgiving retail spree were negative. The term appears to have originated about 50 years ago among police in Philadelphia inconvenienced by downtown crowds kicking off the holiday shopping season. Those crowds added to congestion from traffic in town for the Army-Navy football game, which in that era was generally played in Philly the Saturday after Thanksgiving. Black Friday "was not a happy term," department store historian Michael J. Lisicky told CBS News last year. "The stores were just too crowded, the streets were crowded, the buses and the police were just on overcall and extra duty." Even a sales manager at the department store Gimbels in Philadelphia back in 1975 acknowledged the term's negative connotation and link to traffic headaches. "That's why the bus drivers and cab drivers call today 'Black Friday,' " she told The Associated Press, while watching a policeman struggle with a crowd of jaywalkers. "They think in terms of the headaches it gives them." "Prior to the mid-1980s, the term 'Black Friday' was always used for some calamitous event," columnist Paul Mulshine wrote in New Jersey's Star-Ledger. "All of that negativity makes sense. 'Black Friday' has a naturally gloomy sound to it." Of course retailers have long since embraced it, holding that the "black" in "Black Friday" is borrowed from accounting, meaning they hope to get "in the black" for the year by dint of holiday sales. Some accounts credit this meaning to Peter Strawbridge, president of Strawbridge & Clothier, a now-defunct retailer that was based in Philadelphia. But it doesn't seem that Strawbridge himself liked "Black Friday" much. "It sounds like the end of the world, and we really like the day," he told The Philadelphia Inquirer back in 1984. "If anything, we should call it 'Green Friday.' "
Texas business leaders want to continue tough school accountability measures that first rolled out last year. They fear lawmakers may scale back some standards in the upcoming legislative session. 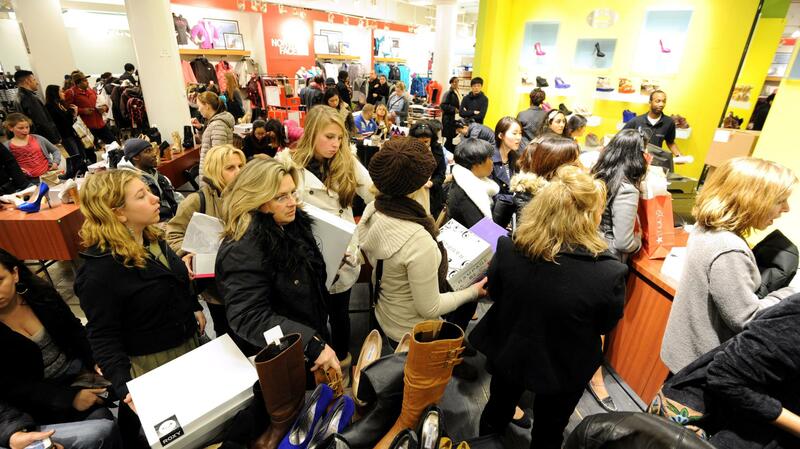 Dallas, TX – U.S. retailers are expecting a big "online" holiday shopping rush today. It's "Cyber Monday". KERA's BJ Austin reports one local marketing expert says the online shopping day is growing faster than Black Friday in-store sales.